What a cute kid. We had our last game this Saturday and I finally remembered to bring the camera. got better! By the end of it CJ was correcting me on my football knowledge which is not a lot. CJ is on the very end with the green sleeves. Do ya see the kids CJ's up against? Here's the whole clan after a victorious game!!! 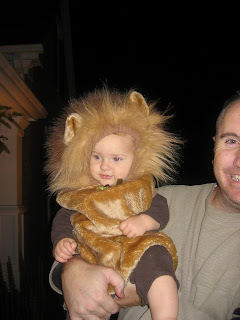 Here's some fun pictures of the kids in their costumes. I'm especially proud of Macey's. 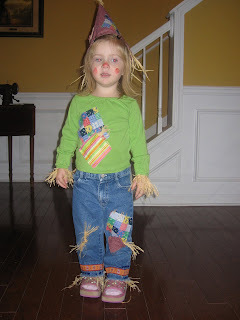 I remember mom did one of us as a scarecrow when we were kids and I thought that would be pretty original. I want to dress her up in fun and different costumes before all she wants to be is a princess, princess, princess. Isn't Mason adorable! He was not happy to have that on so all we got was one picture. 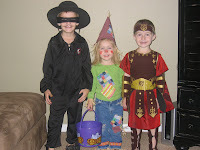 CJ didn't like his Zorro costume the night of the ward Halloween party. He thought it was too boring and "not cool" so we had to come up with something different for Character Day and Halloween. He was very excited about his knight costume! 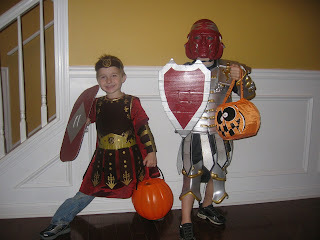 I love Cade's Roman Soldier costume. That was a christmas gift from Auntie last year. 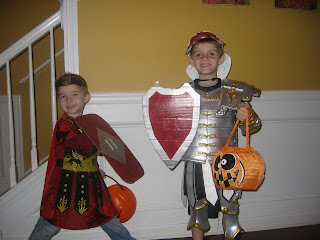 They just love getting dressed up in their costumes and running around the house imagining all sorts of good vs evil battles. 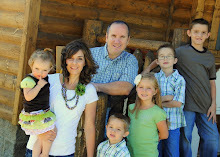 Okay can you tell I don't know how to do this blog stuff yet. I'm learning.